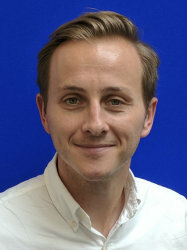 In 2017, Adam joined the Department of Bioengineering at Imperial College London as Lecturer (Assistant Professor) to develop new biomaterials for tissue repair and regeneration. Adam graduated with a first class bachelor's degree from the University of Brighton in Pharmaceutical and Chemical Sciences in 2006. He then gained a PhD in Chemistry from the University of Cambridge in the Melville Laboratory for Polymer Synthesis in 2010. There he worked with Professor Oren Scherman developing supramolecular polymeric materials based on hydrogen bonding motifs. Adam then pursued postdoctoral research at the University of Nottingham with Professor Morgan Alexander and Professor Martyn Davies. Here he developed high-throughput screening methodologies to discover new biomaterials for stem cell interactions. This work led to Adam being awarded an Early Career Researcher Award from the American Vacuum Society's Biomaterials Interfaces Division. Following this, Adam was awarded a Marie Curie International Outgoing fellowship to work with Professor David Mooney at Harvard University in the Wyss Institute for Biologically Inspired Engineering. Here Adam developed biomaterial-based strategies to repair and restore tissues. Following this fellowship, Adam was awarded the Larry Hench Young Investigators Prize by the UK Society for Biomaterials. Li J.; Celiz A. D.*; Yang J. *; Yang Q.; Wamala I.; Whyte W.; Seo B. R.; Vasilyev N. V.; Vlassak J. J.; Suo Z.; Mooney D. J. “Tough Adhesives for Diverse Wet Surfaces” Science 2017, 357, 378 – 381. Celiz A. D.*; Smith J. G. W.*; Patel A. K.; Hook A. L.; Rajamohan D.; George V. T.; Patel M. J.; Epa V. C.; Singh T.; Langer R.; Anderson D. G.; Allen N. D.; Hay D. C.; Winkler D. A.; Barrett D. A.; Davies M. C.; Young L. E.; Denning C.; Alexander M. R. “Discovery of a Novel Polymer for Human Pluripotent Stem Cell Expansion and Multi-Lineage Differentiation.” Advanced Materials 2015, 27, 4006 - 4012. Celiz A. D.; Smith J. G. W.; Langer R.; Anderson D. G.; Barrett D. A.; Winkler D. A.; Davies M. C.; Young L. E.; Denning C.; Alexander M. R. “Materials for Stem Cell Factories of the Future.” Nature Materials 2014, 13, 570 - 579. Celiz A. D.; Smith J. G. W.; Patel A. K; Langer R.; Anderson D. G.; Barrett D. A.; Young L. E.; Davies M. C.; Denning C.; Alexander M. R. “Chemically Diverse Polymer Microarrays and High Throughput Surface Characterization: A Method for Discovery of Materials for Stem Cell Culture” Biomaterials Science 2014, 2, 1604 - 1611.